Bromine is a naturally occurring element found in seas, lakes and underground wells. Bromine resources are geographically distributed with the Dead Sea being the richest resource of bromine having a concentration of 10–12 grams per litre. Bromine derivatives are widely used as reactants and catalysts in the manufacturing of a variety of products such as agrochemicals, biocides, water disinfectants, pharmaceutical intermediates, dyes, completion fluids, flame retardants and photographic chemicals, among others. The principal bromine derivatives are calcium bromide, sodium bromide, zinc bromide, methyl bromide, TBBPA (tetrabromobisphenol-A), DBDPE (Decabromodiphenyl Ethane) and hydrogen bromide. Around 77% of elemental bromine is utilized in the manufacturing of bromine derivatives. The bromine derivatives market is pegged to be a high value market. It is expected to register a decent growth rate in terms of value and grow 1.5X by the end of the forecast period. The high demand for flame retardant plastics from automotive & consumer electronics industries is expected to propel the demand for bromine derivatives to a significant extent. Also, the present rate of urbanization is expected to boost the demand for various plastic products for buildings that require flame retardants as a mandatory requirement. Around 54% of the global population resides in urban areas and this figure is projected to expand to 66% by 2050 (reference: United Nations DESA). This significant increase in urbanisation is anticipated to further fuel the demand for flame retardants in the near future. Increasing demand for PTA for use in polyester films and fiber manufacturing is expected to drive the growth of bromine derivatives over the forecast period However, government policies that regulate the use of flame retardants, including bromine derivatives, to ensure non-hazardous emissions have checked the growth of the global bromine derivatives market to some extent. The global bromine derivatives market has been identified as a highly consolidated one with the top 3 manufacturers of bromine derivatives accounting for over 80% of the total sales. Israel is the major production hub of bromine derivatives, followed by the U.S. and China. In terms of volume, the global consumption of bromine derivatives stood at 873.6 KT at the end of 2016. The plastics industry is a key driver of the bromine derivatives market in terms of end use, which can be attributed to the demand for flame retardant materials for use in the manufacturing of electrical and electronics products. Flame retardants have become mandatory in the manufacture of various products to avoid fires in the event of resistive heating or joule heating. The automotive industry has also witnessed an increase in the demand for bromine derivative-based plastic materials in the fabrication of interior components. Bromine derivatives are also used as clear brine fluids such as sodium bromide, calcium bromides and zinc bromides, which primarily find application in the oil & gas industry, where they are used to control clay hydration during oil & gas exploration. They provide lubrication to preserve drilling equipment, circulate and transport solids and increase efficiency and productivity of oil and gas wells. The oil and gas industry is expected to expand with a strong CAGR in the next five years, which in turn is anticipated to simultaneously drive the consumption of bromine derivatives. Attributing to their catalytic properties, the global consumption of bromine derivatives is slated to be significantly influenced by the increasing production of rubber, plastics and flame retardants. Furthermore, the use of bromine in reducing mercury emissions from coal-fired power stations is also expected to drive demand. However, varying environmental legislations can pose challenges to the growth of the bromine derivatives market during the forecast period. The combined share of plastics and chemicals sectors is estimated to account for more than 50% of the global bromine derivatives market by end use. The rising use of brine fluids derived from zinc bromide, sodium bromide and calcium bromide in the homogenous extraction of oil and gas will continue to drive the market growth to a higher extent. Tetrabromobisphenol A, commonly known as TBBPA, is expected to be the most consumed derivative, and accounted for 219,640.2 MT in terms of volume in 2016. In terms of application, flame retardants will continue to be the major application segment in the bromine derivatives market. The segment registered a total revenue of US$ 1.7 Bn in 2016. 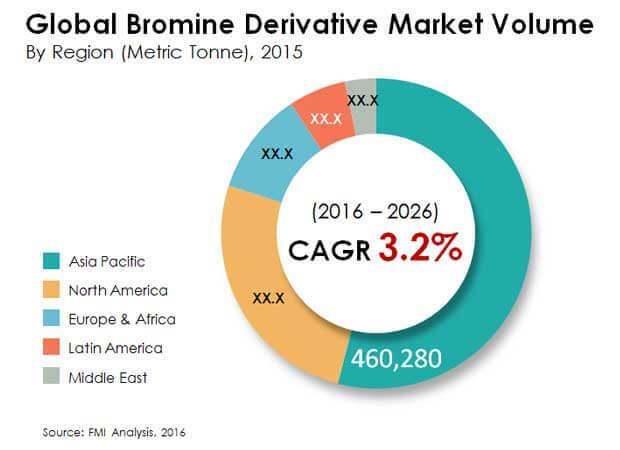 The global bromine derivatives market is understood to be a highly consolidated market, governed primarily by the top 3 tier-1 players involved in the manufacturing and sales of bromine derivatives. Strategic collaborations between key players and sharing of manufacturing technology for new product development are the key growth strategies being adopted by major players in the market. Manufacturers of bromine derivatives sell their products through two prominent channels, i.e. direct end-user sales and through distributors and suppliers. The former channel is preferred in the case of bulk procurement on a contractual level whereas the latter case is used for the general sales of bromine derivatives independently procured by regional suppliers and distributors. Asia Pacific is expected to remain a high growth region and the major consumer of bromine derivatives during the forecast period. Among all countries, China and India are expected to acquire over 60% of the regional bromine derivatives market, which can mainly be attributed to the increasing consumption of bromine derivatives by well-established players in chemical, pharmaceutical and electronics industries in the region. Europe and Africa are considered to be the other prominent regions contributing to the growth of the global bromine derivatives market and are expected to witness steady growth over the forecast period. On the other hand, the North America market is expected to offset the consumption of bromine derivatives, owing to bans and restrictions on the use of certain brominated flame retardants in plastic and electronics products in the U.S. and Canada to comply with the mandatory HSE (health, safety, and environment) standards. Some of the market participants involved in the production and sales of bromine derivatives include Israel Chemicals Limited, Albemarle Corporation, Chemtura Corporation, TETRA Technologies Inc., Gulf Resources Inc., Tosoh Corporation and Tata Chemicals Limited. Manufacturers of bromine derivatives have been forming strategic collaborations to expand their product portfolios and market footprint. For example, in 2015, Chemtura Corporation and Tosoh Corporation entered into a long-term agreement for the manufacturing and sales of the brominated flame retardant, Innovation 100, in Japan. Subsequently, in 2016, Albemarle Corporation entered into a manufacturing joint venture with Israel Chemicals Limited (ICL Group) for the production of the polymeric flame retardant, FR122P for ICL Group and Green Crest for Albemarle Corporation. The global bromine derivatives market has witnessed a significant level of developments involving organic and inorganic growth by the leading bromine derivatives manufacturers in the past 3-5 years. The FMI custom research study on the global bromine derivatives market offers a ten-year analysis and forecast for the global bromine derivatives market between 2016 and 2026. The study on the bromine derivatives market considers 2015 as the base year with market values estimated for the year 2016 and a forecast developed for the duration of 2016 to 2026. Compound Average Growth Rate (CAGR) is represented from 2016 to 2026. The study covers various perspectives of the bromine derivatives market, including market dynamics, industry background and outlook, value chain, market size estimation-forecast-with analyses on competition landscape, where data has been provided on consolidated and granular levels; thus ensuring the analysis of the global bromine derivatives market in a comprehensive manner. The global bromine derivatives market size has been provided by value in US$ Mn and volume of consumption in metric tons. Bromine derivatives are widely use as reactants and catalysts in the manufacturing of a variety of products such as agrochemicals, biocides, water disinfectants, pharmaceutical intermediates, dyes, completion fluids, flame retardants and photographic. The demand and consumption of bromine and its derivative have been considered while conducting the research study. The consumption of bromine derivatives by each end-use industry has been intensively studied and considered in this research study. The demand for bromine derivatives from a variety of applications has also been studied and included in this report. Future Market Insights’ report on bromine derivatives analyses the global market by prominent regions and associated countries. Principally, the bromine derivatives market analysis and its segmentation has been done by derivative type, application and end use industry. The bromine derivatives market research and analysis report offers key insights on the global market scenario and growth trend with respect to the consumption of bromine derivatives. Additionally, pricing, market size and opportunity assessment, associated trends, competition analysis including key developments and overview of key strategies of the bromine derivatives manufacturers, market potential generated from target end use sectors, growth rates and other relevant information and statistics have been presented in a suitable manner for the readers and various stakeholders of the global bromine derivatives market. The report on the global bromine derivatives market is structured to facilitate the reader to develop a thorough understanding of the same. It begins with an executive summary, providing the global bromine derivatives market overview in terms of current and expected market size in terms of value by US$ Mn and volume by metric tons. The key research findings highlighted in the executive summary have been explained with the help of infographics and key highlighted points, market definitions, market size forecast and absolute dollar opportunity generated during the forecast period. Following the executive summary, the report on the global bromine derivatives market assessment begins with a market introduction, defining the market taxonomy and end use segment definitions. The definition also provides a a detailed outline of the uses of bromine derivatives in each end-use industry. Pricing analysis with key takeaways by individual region have also been provided in the report, citing the factors responsible for the existing and probable trends over the forecast period. The next section of the global bromine derivatives market analysis report covers market dynamics, which include drivers and challenges shaping the growth of the global bromine derivatives market and their magnitude of impact. The drivers for the bromine derivatives market have been provided from demand side as well as supply side. Additionally, market dynamics of the bromine derivatives market include current as well as upcoming trends. This is followed by a value chain analysis of the global bromine derivatives market, illustrating the production of elemental bromine to synthesis of bromine derivatives, captive consumption factor and trade and consumption of bromine derivatives, citing examples of prominent companies for each of participant. The trade flow of bromine derivatives has also been highlighted separately by each channel and the rate of margin involved. The report consequently provides an outlook of the global bromine derivatives market for the forecast period and the absolute dollar opportunity expected to be generated during the forecast period. The bromine derivatives market report also provides a pricing analysis, which provides regional prices for each type of bromine derivative, indicating the price difference margins with respect to each region. In the next section of the report, the global market size estimation, analysis for the base year 2015, followed by forecasting of 2016-2026 for Bromine Derivatives has been provided with respect to each end use industry consumption by value (US$ Mn) and Volume (Metric Tons). The section concludes with estimated generation of absolute dollar opportunity for the period 2016-2026. This is followed by analysis of Global Bromine Derivatives market by identified geographical regions. Analysis by individual bromine derivatives has been provided by qualitative and quantitative analyses. The global Bromine Derivatives market analysis and forecast the proceeds with regional analysis including prominent countries having a considerable market size and growth rate. The analysis of Bromine Derivatives with respect to end use industries for each region is also provided in this section. The final section of the global bromine derivatives market report offers a competition analysis, which throws light on the bromine derivatives market structure. The section includes information on the tier-1 and tier-2 manufacturers prevailing in the market. The competition analysis of the bromine derivatives market has been provided to report audiences with a summarized view in the form of a dashboard, which has been categorized on the basis of manufacturer’s estimated market share in the bromine derivatives market, product strength and key differentiating factors and strategies. The report then provides credentials of tier-1 manufacturers individually where key financial, business overview, product/brand portfolio, key developments and strategies employed have been mentioned to evaluate their long-term and short-term strategies, key offerings and recent developments in the bromine derivatives market. Report audiences can gain segment-specific vendor insights to identify and evaluate key competitors on the basis of the in-depth assessment of their capabilities and reputation in the bromine derivatives marketplace. Detailed profiles of the providers are also included in the scope of the report. The key competitors covered in the global bromine derivatives market report include Albemarle Corporation, Chemtura Corporation, Tosoh Corporation, Gulf Resources Inc., Israel Chemicals Limited, Tetra Technologies Inc., Tata Chemicals Limited, Jordan Bromine Company and Hindustan Salts Limited. The global bromine derivatives market report also highlights the following research methodology employed in deriving the estimated market figures with related approach and the type of data sources referred specific to the global bromine derivatives market. In order to offer an accurate forecast, FMI started by sizing the current market (2015), which forms the basis of how the global bromine derivatives market is expected to develop in the future for the period (2016-2026). Given the characteristics of the market, we triangulated the outcome of three different types of analysis, based on primary research, secondary research and our own analysis. However, forecasting the market in terms of various segments and regions is more a matter of quantifying expectations and identifying opportunities rather than rationalizing them after the completion of the forecast exercise. With respective to FMI’s analysis framework, it is imperative to note that, in an ever-fluctuating global economy, we not only conduct forecasts in terms of CAGR, but also analyze the market on the basis of key parameters such as Year-on-Year (Y-o-Y) growth to understand the predictability of the bromine derivatives market and identify the right opportunities available. Our qualitative analysis consists of Basis Point Share (BPS) to understand each individual segment’s relative contribution to the market growth. This detailed level of information is important for the identification of various key trends witnessed in the bromine derivatives market. This has been followed by Y-o-Y (year-on-year) growth trend analysis and market attractiveness analysis by each segment highlighting the causes responsible for displaying the estimated growth trends. Another key feature of this report is the analysis of all the key segments in the bromine derivatives market, sub-segments and the regional adoption and revenue forecast in terms of absolute dollar opportunity. This is traditionally overlooked while forecasting the market; however, the absolute dollar opportunity is critical in assessing the level of opportunity that a provider can look to achieve, as well as to identify potential resources and earnings from a sales and delivery perspective in the bromine derivatives market. In order to understand the key market segments in terms of the growth of the bromine derivatives market across concerned regions, Future Market Insights has developed a Market Attractiveness Index, which will help providers identify real market opportunities where each segment has been measured by 3 reference indices, namely CAGR index, current market share index and absolute dollar opportunity generated over the forecast period. All the qualitative analyses have been provided in the form of infographics with citations of key takeaways.